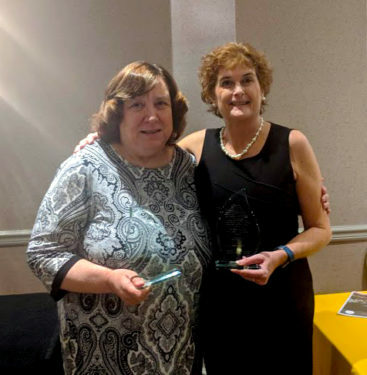 Kathleen Buscemi, left, and Debora Hanna, hold their Lighting the Fire for Catholic Education Awards from the NYS Catholic School Administration Association Dec. 3. Kathleen Buscemi, principal of St. Bernard Catholic Academy, Mill Basin, received the prestigious Lighting the Fire for Catholic Education Award at the annual gathering of the NYS Catholic School Administration Association in Albany, Dec. 3. “She is a true supporter of Catholic education,” said Dr. Thomas Chadzutko, diocesan superintendent of Catholic schools, who nominated Buscemi for the honor. The award recognizes leaders in Catholic education who are committed to achieving excellence in their school communities by implementing programs to meet the spiritual, academic and social-emotional needs of all students. Honorees are individuals who distinguish themselves in their school and community by working as a force for positive change by inspiring others, setting high expectations for their staff and students and working as a force for positive change. A lifelong native of Queens, Buscemi has given more than 43 years of service to the Diocese of Brooklyn as a teacher and principal. She began her career in education as a teacher at Holy Child Jesus School, Richmond Hill, and went on to teach at St. Fidelis School, College Point. She became the principal at St. Bernard in 2002. Also honored with the Lighting the Fire for Catholic Education Award this year was Debora Hanna, principal of St. Andrew Avellino Catholic Academy, Flushing.